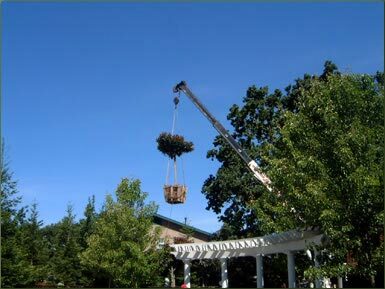 Tree Service | Lafayette Tree & Landscape Inc. Trees enhance gardens dramatically, adding character and charm. Light filtering through the branches, creating shade, providing privacy and a noise buffer are benefits that trees provide. Losing a tree can dramatically affect the ambiance of your garden, decrease property value, and increase energy costs. Wisdom dictates an investment in their continued health. With the expert services of our certified arborist and pesticide controller, clients can proactively take steps to protect their trees from pests, disease and premature loss. Healthy trees must be assisted in developing a good skeletal structure in order to weather winter storms, carry leaf weight in the summertime, and safely surround your home. Our arborist will determine what degree of pruning, if any, is needed. Good drainage is essential for most trees. Our arborist will evaluate the soil conditions surrounding your trees and, if necessary, develop a drainage plan and oversee the installation. Untreated pests and disease are a serious threat to trees. Our certified arborist and pesticide controller will diagnosis and administer appropriate treatment to address any problems uncovered. Occasionally it is necessary to apply pesticides to save the life of a stricken tree. Licenses are renewed in accordance with strict state laws as well as annual continuing education classes.